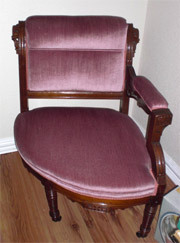 Victorian Style Boudoir Corner Chair. I am told that this is a nice restoration with beautiful pink covering over the original tapestry. 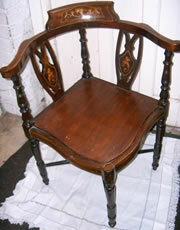 You can see underneath that the original under fabric is still on the chair. The chair seats comfortable and solid. We believe the wood is Mahogany, a very dark wood which features hand carved detail with a matching cover for the back rest.